We heard a lot of talk about foldable phones in 2018, and if those reports turn out to be true, then 2019 could be the year we see a lot of foldable phones land on the market. Many smartphone makers, including Samsung and Oppo, have already revealed their intention of launching such a phone. If the latest leak is to be believed, then Xiaomi’s foldable phone is also not far away. Trusted tipster Evan Blass shared a video on Wednesday and said it may show a three-panel folding phone from Xiaomi. It could mean that the device has three parts: one with the main screen, a second to the right of the main screen, and a third on the left. The screens on both sides are folded to form a smartphone. In the dimly-lit video, we can see a big display providing a large landscape view. The video also shows two side panels folding backward to result in a traditional phone-sized screen. The 20-second clip with Chinese as the set language also offers a look at the lock screen. When the screen is unlocked, we can see Google Maps in landscape view. The handset is then folded back, revealing two hinges near the center in a tri-fold design. When the device is folded, Google Maps also switches from a tablet user interface to a phone UI. With one part folded, the UI adapts to a smaller tablet UI. After Google Maps is closed with the phone already folded, the device appears to be a normal phone. The video also reveals a power button in the center along the top edge of the device. There also appears to be some outward bending at the two hinge points. Other than that, the video does not show anything about the hardware because it is shot in the dark. Is this really Xiaomi’s foldable phone? The leaked video does not offer any substantial proof that the device is actually Xiaomi’s foldable phone. However, some parts of the interface do look similar to Xiaomi’s MIUI skin, like the status bar icons and lock screen shortcuts. Moreover, several identical icons found on the MIUI can be seen in the app drawer of the device. The time shown in the top-left of the display suggests the device is running on Android 9. If we view this leak with past reports, it sounds somewhat credible that this could be Xiaomi’s foldable phone. In July, ET News claimed Xiaomi was working on an “outfolding” phone which would be released in 2019. Xiaomi is also known for coming up with innovative phones. For instance, the Mi Mix phones were among the first phones to come with nearly bezel-free displays. Samsung has already shown its foldable phone, and the phone in the leaked video appears to build on the foldable phone designs we have already seen. Based on Xiaomi’s reputation, there is a good chance the company would be pushing the limits of the foldable phone format. Last year there were also reports of Google and Xiaomi working on a mystery device. Considering that Google has already announced its Android Foldables form factor to prevent fragmentation and off seamless app compatibility, Xiaomi’s foldable phone looks a more likely candidate of a cooperation between the two companies. Nevertheless, it is too early to say anything. The leaked video just shows the screen and leaves many questions unanswered. For example, it doesn’t show where the camera is or if the device can be folded backward. Even Blass says he is unsure about the “authenticity of this video or device,” but whether or not this video is authentic, we may get more information on Xiaomi’s foldable phone in the coming months. 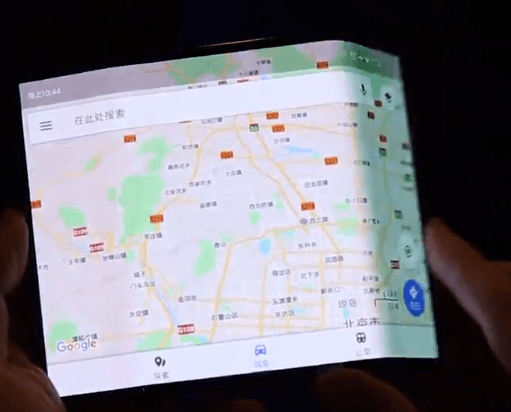 Samsung has been known to be working on a foldable device for years, and the company finally (but briefly), showed the device this past fall. The device features the company’s Infinity Flex display, which folds along a single crease. Samsung’s foldable phone also has another screen on the front. Other phone makers are apparently using different methods to achieve the foldable form factor. For example, the Royole FlexPai, which was the first foldable phone to hit the market, folds in half. Oppo is also working on a foldable phone, which it could unveil at the Mobile World Congress (MWC) in February. LG is also expected to showcase a foldable phone at CES. Microsoft’s much-anticipated Andromeda foldable device could also debut some time this year.